Not Hotdog has been nominated for a primetime Emmy®. Thanks to all the fans for the amazing reception, and to all the people at HBO & Brown Hill Productions who made this possible. To achieve this, we designed a bespoke neural architecture that runs directly on your phone, and trained it with Tensorflow, Keras & Nvidia GPUs. While the use-case is farcical, the app is an approachable example of both deep learning, and edge computing. All AI work is powered 100% by the user’s device, and images are processed without ever leaving their phone. This provides users with a snappier experience (no round trip to the cloud), offline availability, and better privacy. This also allows us to run the app at a cost of $0, even under the load of a million users, providing significant savings compared to traditional cloud-based AI approaches. 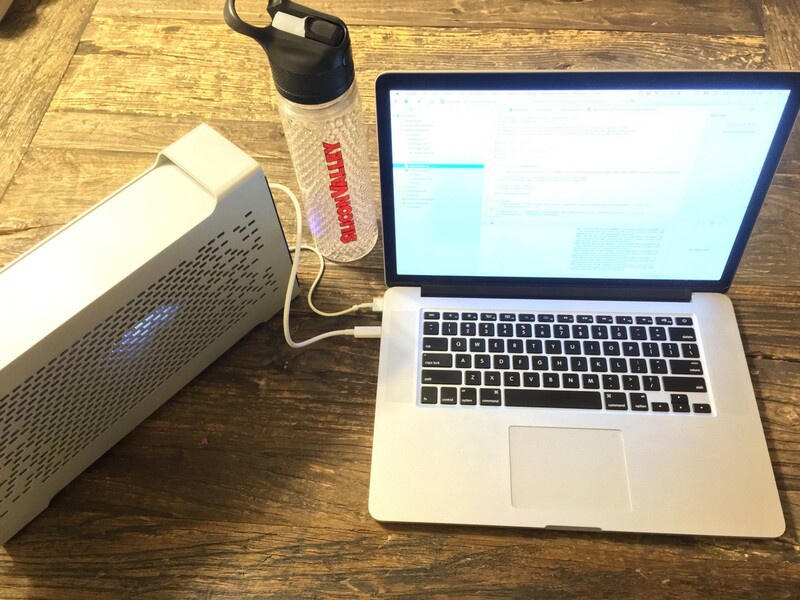 The author’s development setup with the attached eGPU used to train Not Hotdog’s AI. The app was developed in-house by the show, by a single developer, running on a single laptop & attached GPU, using hand-curated data. In that respect, it may provide a sense of what can be achieved today, with a limited amount of time & resources, by non-technical companies, individual developers, and hobbyists alike. In that spirit, this article attempts to give a detailed overview of steps involved to help others build their own apps. If you haven’t seen the show or tried the app (you should! ), the app lets you snap a picture and then tells you whether it thinks that image is of a hotdog or not. It’s a straightforward use-case, that pays homage to recent AI research and applications, in particular ImageNet. While we’ve probably dedicated more engineering resources to recognizing hotdogs than anyone else, the app still fails in horrible and/or subtle ways. Have you ever found yourself reading Hacker News, thinking “they raised a 10M series A for that? 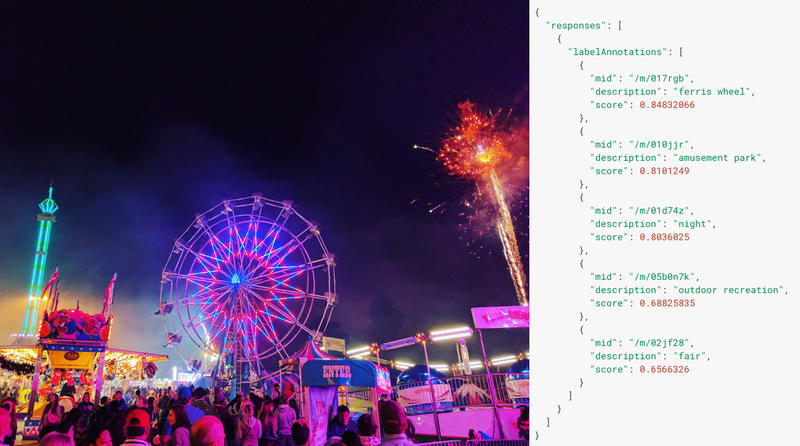 I could build it in one weekend!” This app probably feels a lot like that, and the initial prototype was indeed built in a single weekend using Google Cloud Platform’s Vision API, and React Native. But the final app we ended up releasing on the app store required months of additional (part-time) work, to deliver meaningful improvements that would be difficult for an outsider to appreciate. We spent weeks optimizing overall accuracy, training time, inference time, iterating on our setup & tooling so we could have a faster development iterations, and spent a whole weekend optimizing the user experience around iOS & Android permissions (don’t even get me started on that one). All too often technical blog posts or academic papers skip over this part, preferring to present the final chosen solution. In the interest of helping others learn from our mistake & choices, we will present an abridged view of the approaches that didn’t work for us, before we describe the final architecture we ended up shipping in the next section. We chose React Native to build the prototype as it would give us an easy sandbox to experiment with, and would help us quickly support many devices. The experience ended up being a good one and we kept React Native for the remainder of the project: it didn’t always make things easy, and the design for the app was purposefully limited, but in the end React Native got the job done. First and foremost, its accuracy in recognizing hotdogs was only so-so. While it’s great at recognizing a large amount of things, it’s not so great at recognizing one thing specifically, and there were various very common examples that would fail during our experiments with it in 2016. Because of its nature as a cloud service, it was necessarily slower than running on device (network lag is painful! ), and unavailable offline. The idea of images leaving the device could also potentially trigger privacy & legal concerns. Finally, if the app took off, the cost of running on Google Cloud could have become prohibitive. For these reasons, we started experimenting with what’s trendily called “edge computing”, which for our purposes meant that after training our neural network on our laptop, we would export it and embed it directly into our mobile app, so that the neural network execution phase (or inference) would run directly inside the user’s phone. Through a chance encounter with Pete Warden of the TensorFlow team, we had become aware of its ability to run TensorFlow directly embedded on an iOS device, and started exploring that path. After React Native, TensorFlow became the second fixed part of our stack. It only took a day of work to integrate TensorFlow’s Objective-C++ camera example in our React Native shell. It took slightly longer to use their transfer learning script, which helps you retrain the Inception architecture to deal with a more specific image problem. Inception is the name of a family of neural architectures built by Google to deal with image recognition problems. Inception is available “pre-trained” which means the training phase has been completed and the weights are set. 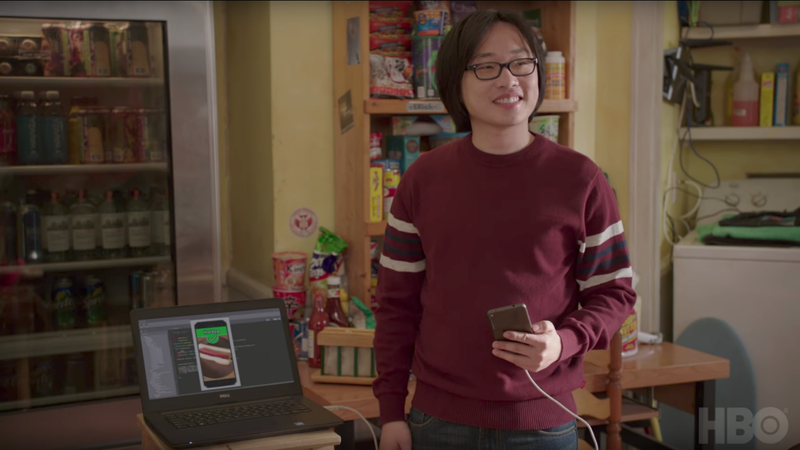 Most often for image recognition networks, they have been trained on ImageNet, a dataset containing over 20,000 different types of objects (hotdogs are one of them). However, much like Google Cloud’s Vision API, ImageNet training rewards breadth as much as depth here, and out-of-the-box accuracy on a single one of the 20,000+ categories can be lacking. As such, retraining (also called “transfer learning”) aims to take a full-trained neural net, and retrain it to perform better on the specific problem you’d like to handle. This usually involves some degree of “forgetting”, either by excising entire layers from the stack, or by slowly erasing the network’s ability to distinguish a type of object (e.g. chairs) in favor of better accuracy at recognizing the one you care about (i.e. hotdogs). 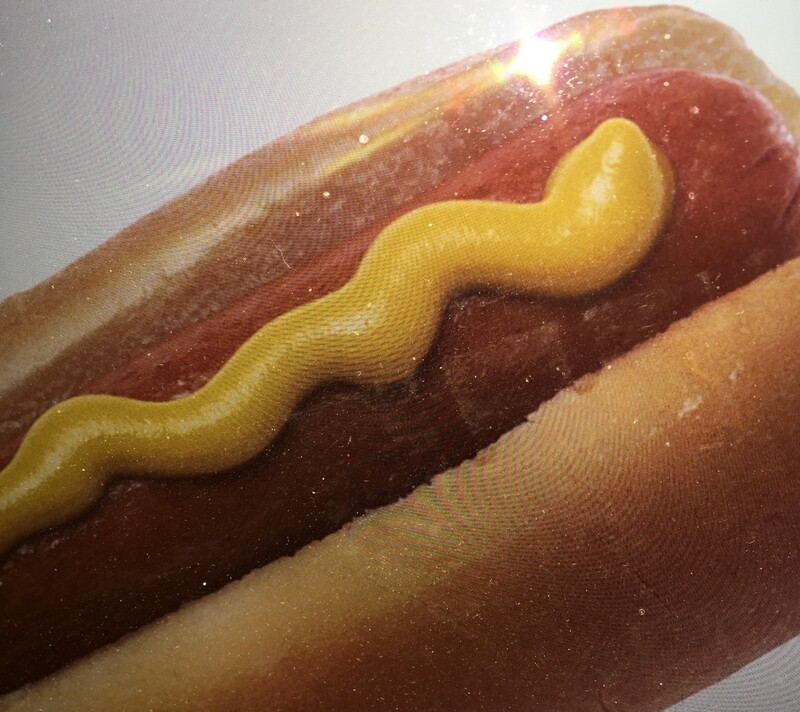 While the network (Inception in this case) may have been trained on the 14M images contained in ImageNet, we were able to retrain it on a just a few thousand hotdog images to get drastically enhanced hotdog recognition. The big advantage of transfer learning are you will get better results much faster, and with less data than if you train from scratch. A full training might take months on multiple GPUs and require millions of images, while retraining can conceivably be done in hours on a laptop with a couple thousand images. One of the biggest challenges we encountered was understanding exactly what should count as a hotdog and what should not. Defining what a “hotdog” is ends up being surprisingly difficult (do cut up sausages count, and if so, which kinds?) and subject to cultural interpretation. Similarly, the “open world” nature of our problem meant we had to deal with an almost infinite number of inputs. While certain computer-vision problems have relatively limited inputs (say, x-rays of bolts with or without a mechanical default), we had to prepare the app to be fed selfies, nature shots and any number of foods. Suffice to say, this approach was promising, and did lead to some improved results, however, it had to be abandoned for a couple of reasons. First The nature of our problem meant a strong imbalance in training data: there are many more examples of things that are not hotdogs, than things that are hotdogs. In practice this means that if you train your algorithm on 3 hotdog images and 97 non-hotdog images, and it recognizes 0% of the former but 100% of the latter, it will still score 97% accuracy by default! This was not straightforward to solve out of the box using TensorFlow’s retrain tool, and basically necessitated setting up a deep learning model from scratch, import weights, and train in a more controlled manner. At this point we decided to bite the bullet and get something started with Keras, a deep learning library that provides nicer, easier-to-use abstractions on top of TensorFlow, including pretty awesome training tools, and a class_weights option which is ideal to deal with this sort of dataset imbalance we were dealing with. We used that opportunity to try other popular neural architectures like VGG, but one problem remained. None of them could comfortably fit on an iPhone. They consumed too much memory, which led to app crashes, and would sometime takes up to 10 seconds to compute, which was not ideal from a UX standpoint. Many things were attempted to mitigate that, but in the end it these architectures were just too big to run efficiently on mobile. SqueezeNet vs. AlexNet, the grand-daddy of computer vision architectures. Source: SqueezeNet paper. To give you a context out of time, this was roughly the mid-way point of the project. By that time, the UI was 90%+ done and very little of it was going to change. But in hindsight, the neural net was at best 20% done. We had a good sense of challenges & a good dataset, but 0 lines of the final neural architecture had been written, none of our neural code could reliably run on mobile, and even our accuracy was going to improve drastically in the weeks to come. The problem directly ahead of us was simple: if Inception and VGG were too big, was there a simpler, pre-trained neural network we could retrain? At the suggestion of the always excellent Jeremy P. Howard (where has that guy been all our life? ), we explored Xception, Enet and SqueezeNet. We quickly settled on SqueezeNet due to its explicit positioning as a solution for embedded deep learning, and the availability of a pre-trained Keras model on GitHub (yay open-source). So how big of a difference does this make? An architecture like VGG uses about 138 million parameters (essentially the number of numbers necessary to model the neurons and values between them). Inception is already a massive improvement, requiring only 23 million parameters. SqueezeNet, in comparison only requires 1.25 million. During the training phase, it’s much faster to train a smaller network. There’s less parameters to map in memory, which means you can parallelize your training a bit more (larger batch size), and the network will converge (i.e., approximate the idealized mathematical function) more quickly. In production, the model is much smaller and much faster. SqueezeNet would require less than 10MB of RAM, while something like Inception requires 100MB or more. The delta is huge, and particularly important when running on mobile devices that may have less than 100MB of RAM available to run your app. Smaller networks also compute a result much faster than bigger ones. As a corollary, smaller networks are usually less accurate overall than big ones. When trying to recognize ImageNet’s 20,000 different objects, SqueezeNet will only score around 58%, whereas Vgg will be accurate 72% of the time. It’s harder to use transfer learning on a small network. Technically, there is nothing preventing us from using the same approach we used with Inception & Vgg, have SqueezeNet “forget” a little bit, and retrain it specifically for hotdogs vs. not hotdogs. In practice, we found it hard to tune the learning rate, and results were always more disappointing than training SqueezeNet from scratch. This could also be caused or worsened by the open-world nature of our problem. Supposedly, smaller networks rarely overfit, but this happened to us with several “small” architectures. Overfitting means that your network specializes too much, and instead of learning how to recognize hotdogs in general, it learns to recognize exactly & only the specific hotdog images you were training with. A human analogue would be visually-memorizing exactly which of the images presented to you were of a “hotdog” without abstracting that a hotdog is usually composed of a sausage in a bun, possibly with condiments, etc. If you were presented with a brand new hotdog image that wasn’t one of the ones you memorized, you would be inclined to say it’s not a hotdog. Because smaller networks usually have less “memory”, it’s easy to see why it would be harder for them to specialize. But in several cases, our small networks’ accuracy jumped up to 99% and suddenly became unable to recognize images it had not seen in training. This usually disappeared once we added enough data augmentation (stretching/distorting input images semi-randomly so instead of being trained 1,000 times on each of the 1,000 images, the network is trained on meaningful variations of the 1,000 images making it unlikely the network will memorize exactly the 1,000 images and instead will have to learn to recognize the “features” of a hotdog (bun, sausage, condiments, etc.) while staying fluid/general enough not to get overly attached to specific pixel values of specific images in the training set. Data Augmentation example from the Keras Blog. During this phase, we started experimenting with tuning the neural network architecture. In particular, we started using Batch Normalization and trying different activation functions. Batch Normalization helps your network learn faster by “smoothing” the values at various stages in the stack. Exactly why this works is seemingly not well-understood yet, but it has the effect of helping your network converge much faster, meaning it achieves higher accuracy with less training, or higher accuracy after the same amount of training, often dramatically so. Activation functions are the internal mathematical functions determining whether your “neurons” activate or not. Many papers still use ReLU, the Rectified Linear Unit, but we had our best results using ELU instead. 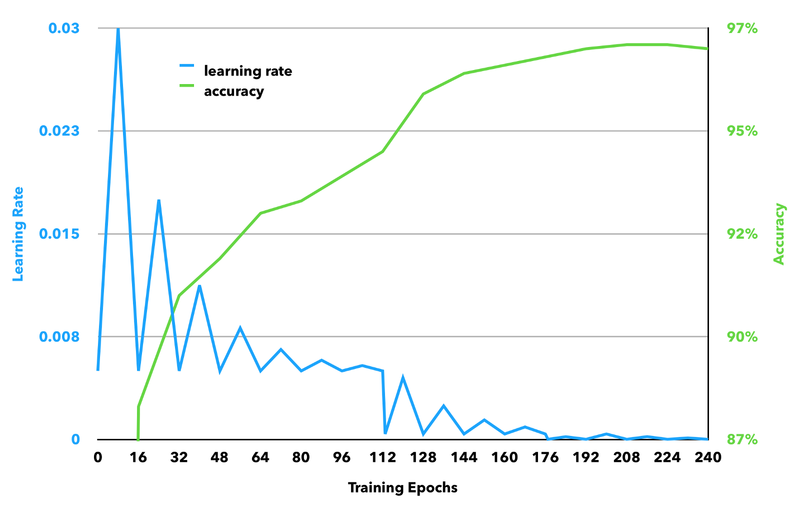 After adding Batch Normalization and ELU to SqueezeNet, we were able to train neural network that achieve 90%+ accuracy when training from scratch, however, they were relatively brittle meaning the same network would overfit in some cases, or underfit in others when confronted to real-life testing. Even adding more examples to the dataset and playing with data augmentation failed to deliver a network that met expectations. So while this phase was promising, and for the first time gave us a functioning app that could work entirely on an iPhone, in less than a second, we eventually moved to our 4th & final architecture. Our final architecture was spurred in large part by the publication on April 17 of Google’s MobileNets paper, promising a new neural architecture with Inception-like accuracy on simple problems like ours, with only 4M or so parameters. This meant it sat in an interesting sweet spot between a SqueezeNet that had maybe been overly simplistic for our purposes, and the possibly overwrought elephant-trying-to-squeeze-in-a-tutu of using Inception or VGG on Mobile. The paper introduced some capacity to tune the size & complexity of network specifically to trade memory/CPU consumption against accuracy, which was very much top of mind for us at the time. With less than a month to go before the app had to launch we endeavored to reproduce the paper’s results. This was entirely anticlimactic as within a day of the paper being published a Keras implementation was already offered publicly on GitHub by Refik Can Malli, a student at Istanbul Technical University, whose work we had already benefitted from when we took inspiration from his excellent Keras SqueezeNet implementation. The depth & openness of the deep learning community, and the presence of talented minds like R.C. is what makes deep learning viable for applications today — but they also make working in this field more thrilling than any tech trend we’ve been involved with. We do not use Batch Normalization & Activation between depthwise and pointwise convolutions, because the XCeption paper (which discussed depthwise convolutions in detail) seemed to indicate it would actually lead to less accuracy in architecture of this type (as helpfully pointed out by the author of the QuickNet paper on Reddit). This also has the benefit of reducing the network size. We did not use PELU. While promising, this activation function seemed to fall into a binary state whenever we tried to use it. Instead of gradually improving, our network’s accuracy would alternate between ~0% and ~100% from one batch to the next. It’s unclear why this happened, and might just come down to an implementation error or user error. Fusing the width/height axes of our images had no effect. We did not use SELU. A short investigation between the iOS & Android release led to results very similar to PELU. It’s our suspicion that SELU should not be used in isolation as a sort of activation function silver bullet, but rather — as the paper’s title implies — as part of a narrowly-defined SNN architecture. We maintain the use of Batch Normalization with ELU. There are many indications that this should be unnecessary, however, every experiment we ran without Batch Normalization completely failed to converge. This could be due to the small size of our architecture. We used Batch Normalization before the activation. While this is a subject of some debate these days, our experiments placing BN after activation on small networks failed to converge as well. To optimize the network we used Cyclical Learning Rates and (fellow fast.ai student) Brad Kenstler’s excellent Keras implementation. CLRs take the guessing game out of finding the optimal learning rate for your training. Even more importantly by adjusting the learning rate both up & down throughout your training, they help achieve a final accuracy that’s in our experience better than a traditional optimizer. For both of these reasons, we can’t conceive using anything else than CLRs to train a neural network in the future. For what it’s worth, we saw no need to adjust the α or ρ values from the MobileNets architecture. Our model was small enough for our purposes at α = 1, and computation was fast enough at ρ = 1, and we preferred to focus on achieving maximum accuracy. However, this could be helpful when attempting to run on older mobile devices, or embedded platforms. So how does this stack work exactly? Deep Learning often gets a bad rap for being a “black box”, and while it’s true many components of it can be mysterious, the networks we use often leak information about how some of their magic work. 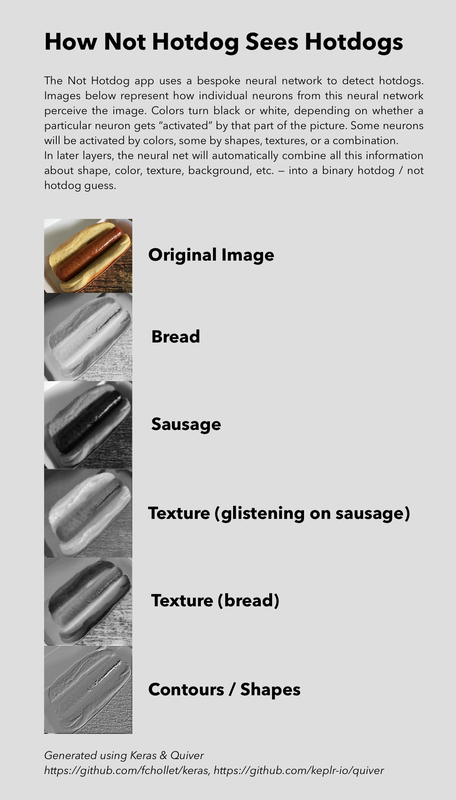 We can look at the layers of this stack and how they activate on specific input images, giving us a sense of each layer’s ability to recognize sausage, buns, or other particularly salient hotdog features. Matching image types to expected production inputs. Our guess was people would mostly try to photograph actual hotdogs, other foods, or would sometimes try to trick the system with random objects, so our dataset reflected that. Give lots of examples of things that are similar that may trip your network. Some of the things that look most similar to hotdogs are other foods (such as hamburgers, sandwiches, or in the case of naked hotdogs, baby carrots or even cooked cherry tomatoes). Our dataset reflected that. Expect distortions: in mobile situations, most photos will be worse than the “average” picture taken with a DLSR or in perfect lighting conditions. Mobile photos are dim, noisy, taken at an angle. Aggressive data augmentation was key to counter this. Additionally we figured that users may lack access to real hotdogs, so may try photographing hotdogs from Google search results, which led to its own types of distortion (skewing if photo is taken at angle, flash reflection on the screen visible moiré effect caused by taking a picture of an LCD screen with a mobile camera). These specific distortion had an almost uncanny ability to trick our network, not unlike recently-published papers on Convolutional Network’s (lack of) resistance to noise. Using Keras’ channel shift feature resolved most of these issues. Example distortion introduced by moiré and a flash. Original photo: Wikimedia Commons. Some edge cases were hard to catch. In particular, images of hotdogs taken with a soft focus or with lots of bokeh in the background would sometimes trick our neural network. This was hard to defend against as a) there just aren’t that many photographs of hotdogs in soft focus (we get hungry just thinking about it) and b) it could be damaging to spend too much of our network’s capacity training for soft focus, when realistically most images taken with a mobile phone will not have that feature. We chose to leave this largely unaddressed as a result. The final composition of our dataset was 150k images, of which only 3k were hotdogs: there are only so many hotdogs you can look at, but there are many not hotdogs to look at. The 49:1 imbalance was dealt with by saying a Keras class weight of 49:1 in favor of hotdogs. Of the remaining 147k images, most were of food, with just 3k photos of non-food items, to help the network generalize a bit more and not get tricked into seeing a hotdog if presented with an image of a human in a red outfit. We applied rotations within ±135 degrees — significantly more than average, because we coded the application to disregard phone orientation. These numbers were derived intuitively, based on experiments and our understanding of the real-life usage of our app, as opposed to careful experimentation. The final key to our data pipeline was using Patrick Rodriguez’s multiprocess image data generator for Keras. While Keras does have a built-in multi-threaded and multiprocess implementation, we found Patrick’s library to be consistently faster in our experiments, for reasons we did not have time to investigate. This library cut our training time to a third of what it used to be. The network was trained using a 2015 MacBook Pro and attached external GPU (eGPU), specifically an Nvidia GTX 980 Ti (we’d probably buy a 1080 Ti if we were starting today). We were able to train the network on batches of 128 images at a time. The network was trained for a total of 240 epochs, meaning we ran all 150k images through the network 240 times. This took about 80 hours. Phase 1 ran for 112 epochs (7 full CLR cycles with a step size of 8 epochs), with a learning rate between 0.005 and 0.03, on a triangular 2 policy (meaning the max learning rate was halved every 16 epochs). Phase 2 ran for 64 more epochs (4 CLR cycles with a step size of 8 epochs), with a learning rate between 0.0004 and 0.0045, on a triangular 2 policy. Phase 3 ran for 64 more epochs (4 CLR cycles with a step size of 8 epochs), with a learning rate between 0.000015 and 0.0002, on a triangular 2 policy. UPDATED: a previous version of this chart contained inaccurate learning rates. While learning rates were identified by running the linear experiment recommended by the CLR paper, they seem to intuitively make sense, in that the max for each phase is within a factor of 2 of the previous minimum, which is aligned with the industry standard recommendation of halving your learning rate if your accuracy plateaus during training. In the interest of time we performed some training runs on a Paperspace P5000 instance running Ubuntu. In those cases, we were able to double the batch size, and found that optimal learning rates for each phase were roughly double as well. Even having designed a relatively compact neural architecture, and having trained it to handle situations it may find in a mobile context, we had a lot of work left to make it run properly. Trying to run a top-of-the-line neural net architecture out of the box can quickly burns hundreds megabytes of RAM, which few mobile devices can spare today. Beyond network optimizations, it turns out the way you handle images or even load TensorFlow itself can have a huge impact on how quickly your network runs, how little RAM it uses, and how crash-free the experience will be for your users. This was maybe the most mysterious part of this project. Relatively little information can be found about it, possibly due to the dearth of production deep learning applications running on mobile devices as of today. However, we must commend the Tensorflow team, and particularly Pete Warden, Andrew Harp and Chad Whipkey for the existing documentation and their kindness in answering our inquiries. Rounding the weights of our network helped compressed the network to ~25% of its size. Essentially instead of using the arbitrary stock values derived from your training, this optimization picks the N most common values and sets all parameters in your network to these values, which drastically reduces the size of your network when zipped. This however has no impact on the uncompressed app size, or memory usage. We did not ship this improvement to production as the network was small enough for our purposes, and we did not have time to quantify how much of a hit the rounding would have on the accuracy of the app. Removing unnecessary ops from the TensorFlow lib: TensorFlow is in some respect a virtual machine, able to interpret a number or arbitrary TensorFlow operations: addition, multiplications, concatenations, etc. You can get significant weight (and memory) savings by removing unnecessary ops from the TensorFlow library you compile for ios. Other improvements might be possible. For example unrelated work by the author yielded 1MB improvement in Android binary size with a relatively simple trick, so there may be more areas of TensorFlow’s iOS code that can be optimized for your purposes. Instead of using TensorFlow on iOS, we looked at using Apple’s built-in deep learning libraries instead (BNNS, MPSCNN and later on, CoreML). We would have designed the network in Keras, trained it with TensorFlow, exported all the weight values, re-implemented the network with BNNS or MPSCNN (or imported it via CoreML), and loaded the parameters into that new implementation. However, the biggest obstacle was that these new Apple libraries are only available on iOS 10+, and we wanted to support older versions of iOS. As iOS 10+ adoption and these frameworks continue to improve, there may not be a case for using TensorFlow on device in the near future. More carefully tune our data-augmentation parameters. Measure accuracy end-to-end, i.e. the final determination made by the app abstracting things like whether our app has 2 or many more categories, what the final threshold for hotdog recognition is (we ended up having the app say “hotdog” if recognition is above 0.90 as opposed to the default of 0.5), after weights are rounded, etc. Building a feedback mechanism into the app — to let users vent frustration if results are erroneous, or actively improve the neural network. Finally, we’d be remiss not to mention the obvious and important influence of User Experience, Developer Experience and built-in biases in developing an AI app. Each probably deserve their own post (or their own book) but here are the very concrete impacts of these 3 things in our experience. UX (User Experience) is arguably more critical at every stage of the development of an AI app than for a traditional application. There are no Deep Learning algorithms that will give you perfect results right now, but there are many situations where the right mix of Deep Learning + UX will lead to results that are indistinguishable from perfect. Proper UX expectations are irreplaceable when it comes to setting developers on the right path to design their neural networks, setting the proper expectations for users when they use the app, and gracefully handling the inevitable AI failures. 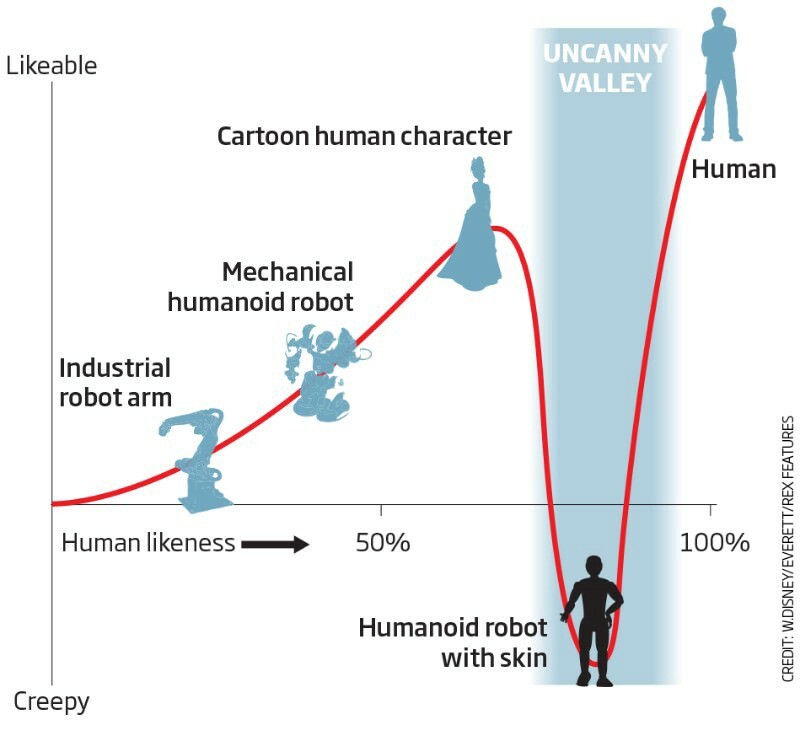 Building AI apps without a UX-first mindset is like training a neural net without Stochastic Gradient Descent: you will end up stuck in the local minima of the Uncanny Valley on your way to building the perfect AI use-case. DX (Developer Experience) is extremely important as well, because deep learning training time is the new horsing around while waiting for your program to compile. We suggest you heavily favor DX first (hence Keras), as it’s always possible to optimize runtime for later runs (manual GPU parallelization, multi-process data augmentation, TensorFlow pipeline, even re-implementing for caffe2 / pyTorch). Even projects with relatively obtuse APIs & documentation like TensorFlow greatly improve DX by providing a highly-tested, highly-used, well-maintained environment for training & running neural networks. For the same reason, it’s hard to beat both the cost as well as the flexibility of having your own local GPU for development. Being able to look at / edit images locally, edit code with your preferred tool without delays greatly improves the development quality & speed of building AI projects. Most AI apps will hit more critical cultural biases than ours, but as an example, even our straightforward use-case, caught us flat-footed with built-in biases in our initial dataset, that made the app unable to recognize French-style hotdogs, Asian hotdogs, and more oddities we did not have immediate personal experience with. It’s critical to remember that AI do not make “better” decisions than humans — they are infected by the same human biases we fall prey to, via the training sets humans provide. Thanks to: Mike Judge, Alec Berg, Clay Tarver, Todd Silverstein, Jonathan Dotan, Lisa Schomas, Amy Solomon, Dorothy Street & Rich Toyon, and all the writers of the show — the app would simply not exist without them. Meaghan, Dana, David, Jay, and everyone at HBO. Scale Venture Partners & GitLab. Rachel Thomas and Jeremy Howard & Fast AI for all that they have taught me, and for kindly reviewing a draft of this post. Check out their free online Deep Learning course, it’s awesome! JP Simard for his help on iOS. And finally, the TensorFlow team & r/MachineLearning for their help & inspiration.